VILLANOVA, PA. – The Villanova Wildcats held the Providence Friars to eight first half points and 20.8 percent shooting from the field for the game en route to a 53-33 win in a game played at the Finneran Pavilion on Friday evening. With the victory, the Wildcats improve to 14-7 overall and 5-5 in Big East play, while Providence falls to 13-9 overall and 5-5 in league play. Villanova has won three in a row and four of its last five. 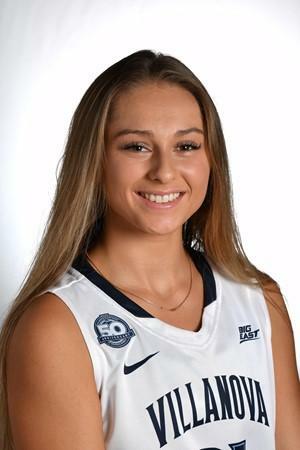 With 5:05 to play in the fourth quarter, senior guard Adrianna Hahn (Ursuline) drained a three from the left wing giving her the Villanova school record for three-point field goals made in a career with 284. The previous mark of 283 was held by Trish Juhline who played for the Wildcats from 1999-2003. The Wildcats led 20-6 with 4:22 remaining in the second quarter, when Villanova used an 11-2 spurt to take a 31-8 advantage at halftime. Nine of the 11 points came on three-point field goals by Hahn, junior guard Kelly Jekot and senior forward Jannah Tucker. Jekot accounted for the other two points on a driving lay-up. Providence finished the first half making just four of the 28 from the field for 14.2 percent, including an 0-for-7 effort from three-point range. The Wildcats shot 42.8 percent from the floor in the opening 20 minutes on 12-of-28 shooting. After going 0-for-2 from long distance in the first quarter, Villanova was 4-of-9 from behind the arc in the second quarter. A three-point field goal by Friar freshman Kaela Webb on the first possession of the fourth quarter sliced the Villanova lead to 40-27. On the game's next possession, Wildcat junior forward Mary Gedaka connected on a three to put her team back up 16 at 43-27. After two free throws by Friar senior Maddie Jolin made it a 43-29 game, the Wildcats ran off eight straight points to open up a 51-29 lead at the 5:05 mark. The eight points came on two threes by Hahn and a lay-up by Gedaka. In the win, Jekot and Hahn had 14 points each. Jekot added five rebounds and two assists, while Hahn had five rebounds. Gedaka was the third Wildcat in double figures with 13 points to go with a game-high tying eight rebounds. Providence was paced by Yoyo Nogic who had eight points. For the game, Villanova was 21-of-57 from the field (36.8%), 8-of-29 from three (27.6%) and 3-of-5 from the foul line (60.0%), while Providence shot 20.8 percent from the floor (11-of-53), 20.0 percent from behind the arc (3-of-15) and 80.0 percent from the charity stripe (8-of-10). The Wildcats owned a 44-36 advantage on the backboards. Villanova returns to action on Sunday, Feb. 3, when the Wildcats play host to the Creighton Bluejays. Tip-off at the Finneran Pavilion is set for 2 p.m. The game can be seen live on FS1. NOTES: The Wildcats now lead the all-time series over Providence by a 48-27 count and have won 26 of the last 32 meetings... Kelly Jekot has now scored double figures in 16 of the 21 games this season…Of all the opponents Villanova has faced over the years, the Wildcats have played Providence more than any other team at 75 all-time meetings…The Wildcats improve to 7-3 at home this season…Mary Gedaka is 31-of-37 (.837) from the field in her last four games.